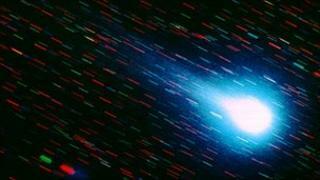 A celestial event seen by the ancient Greeks may be the earliest sighting of Halley's comet, new evidence suggests. According to ancient writers, a large meteorite smacked into northern Greece between 466BC and 467BC. The writers also described a comet in the sky at the time the meteorite fell to Earth, but this detail has received little attention, say the researchers. Comet Halley would have been visible for about 80 days in 466BC, researchers write in the Journal of Cosmology. New Scientist magazine reports that, until now, the earliest probable sighting of the comet was an orbit in 240BC, an event recorded by Chinese astronomers. If the new findings are confirmed, the researchers will have pushed back the date of the first observation of Comet Halley by 226 years. The latest idea is based on accounts by ancient authors and concerns a meteorite that is said to have landed in the Hellespont region of northern Greece in 466-467BC. The space rock fell during daylight hours and was about the size of "a wagon load", according to ancient sources. The object, described as having a "burnt colour", became a tourist attraction for more than 500 years. In his work Meteorology, Aristotle wrote about the event about a century after it occurred. He said that around the same time the meteorite fell, "a comet was visible in the west". Astronomer Eric Hintz and philosopher Daniel Graham, both of Brigham Young University in Provo, Utah, reconstructed the likely path of Halley's comet, to see whether it agreed with the ancient observations. They calculated that Halley's comet could have been visible for about 80 days between early June and late August in 466BC - depending on atmospheric conditions and the darkness of the sky. "It's tough going back that far in time. It's not like an eclipse, which is really predictable," co-author Eric Hintz, from Brigham Young University in Provo, Utah, told BBC News. "But we feel fairly good about this. If the [sighting] in 240BC is accepted, this has a fairly solid possibility." He added: "If accepted, this would be three orbits earlier [than the Chinese sighting]." The reconstruction of the comet's path agrees with the ancient reports, which say the comet was visible for about 75 days. The researchers point out that while the Chinese and Babylonians kept meticulous records of heavenly phenomena for centuries, the ancient Greeks did not. Nevertheless, the Greek accounts do provide important information, say Graham and Hintz, such as the comet's period of visibility from Earth. Asked whether it was possible that the meteorite fall and the pass by Halley's Comet could be linked, Dr Hintz was doubtful. "it would be really neat if they were connected - if it was a piece of Halley's that fell. My feeling is that it was just a really cool coincidence," said Dr Hintz. The researchers say that there remains the possibility that other ancient sightings of comets could be uncovered from Chinese and Babylonian records.